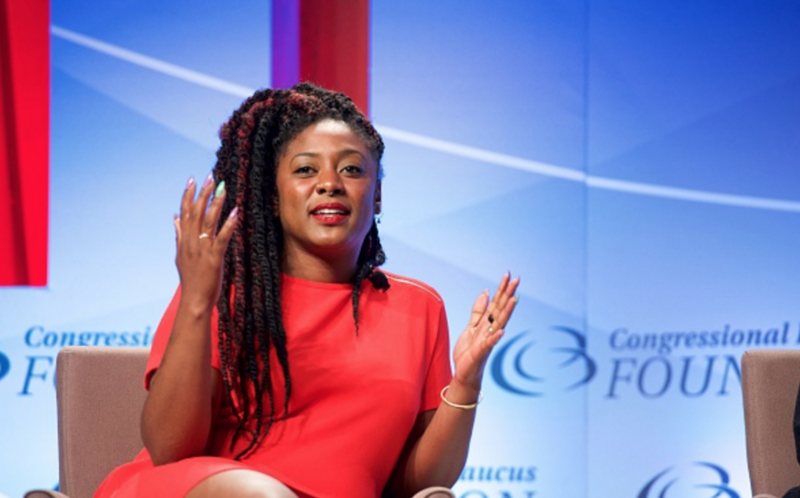 Home Alicia Garza Black liberation Black liberation movements Black Lives Matter racism Black Lives Matter Founder, Alicia Garza: "There is a Way to Use Voting Strategically"
Black Lives Matter Founder, Alicia Garza: "There is a Way to Use Voting Strategically"
As the Black liberation movement wages on, it has never been more clear these are fights that will have to be won on many fronts. The interests of marginalized people require both community organizing and public policy agenda setting, Alicia Garza told For Harriet. Garza is one of three founders of Black Lives Matter. She is also a longtime organizer who works with the National Domestic Workers Alliance. She spoke to editor-in-chief, Kimberly Foster, about We Won't Wait, a new campaign that demands the needs of women of color, low income women and poor women are represented in public policy, as well as the first Movement for Black Lives policy platform. Let's start with the election. You are involved with an initiative that makes sure that the needs and concerns of women of color and low income women are addressed. What exactly is at stake? I think what's at stake when low income women and women of color, black women, immigrant women are not fully engaged in the process is a couple things. One, I think what's at stake is we miss the opportunity to really transform the policies and practices that we have that excludes those women from the decisions that impact their lives. I think we've identified that that's a big problem. It's not a new one. It's one that has existed since the beginning and the founding of this country. It's one that the leadership of Black women and immigrant women and women of color and poor women have led to change for generations. It is because of those folks that we have even some of the access that we have now, but we certainly need to keep going. Then the other piece that I think is really at stake is the future of families in this country. One of the things that we know is that there are many more households that are led by women, particularly women of color, particularly women at the margins. If we're not ready or willing to be bold in addressing some of the problems that we face, it means that more and more of our children and more and more people in our families will suffer the impact. That's, for me, why it's critical that those groups of folks are really at the center of changing what's not working in this country. There are a lot of people who believe that voting is not a way to create change in 2016, that it's not effective or viable. How do you feel about those sentiments? I don't want to dismiss that. That comes from somewhere. People are disillusioned by the broken promise of democracy. More than being disillusioned, many people are locked out of the process. There are people who have the ability, technically, to access the mechanism of voting, but then there's even more people that are locked out from even being able to participate. It's important that, as we're having that conversation, that we're acknowledging that that's not just about people throwing a temper tantrum. That's really about some of the failures of our democratic system. With that being said, every electoral cycle, but this one in particular, there's lots of conversation that we have that's so polarizing. It's like if you don't vote, then you're the worst person in the world. If you do vote, then you're a sell out to the system. I actually feel like we need to be able to embrace a number of different ways that people want to change what's happening. Voting is not the only way to do that. Voting is a way to do that, and it's an effective way only if it is couched in a larger strategy for social change. I think part of the disillusionment that people feel really is rooted in the fact that [the] choices they're presented with don't seem very strategic. That's something that we have to change. We do need to move beyond the politics of voting for candidates and personalities to real practices and policies that are going to impact our lives. One of the weird dynamics about presidential elections is that it actually leaves out the understanding that the president has some power, but their power is limited. That was set up in 1777 or whenever with the Constitutional Convention. Actually, it's not just about who you vote for for president, but it's also very much about who you also vote to be in the halls of Congress. Again, if we talk about voting outside of that context, then we're not really being genuine around how we leverage the power of the vote. That's one. On the other hand, to be very, very clear, and this is my personal opinion. This is not the opinion of any group that I'm associated with or involved in. My personal opinion is that there is a way for us, in this electoral cycle, to use voting strategically. For me personally, I will be voting. I will not be endorsing candidates. None of the groups that I work with will be endorsing candidates. We are endorsing a vision. That vision is the vision of the movement. In that endorsement, if and when we choose to use the power of the vote, it's very much about choosing the terrain on which we want to fight in order to win that vision. For me, I know that whoever is in office I plan to hold accountable. The scenarios look really different under each candidate. I think it's important for us to be mindful of that, but there is diversity in the movement about what tactics we use. My personal push would be we need to use all of them. If you're not participating in the electoral system, that doesn't mean that you're not doing something productive to make change happen. We just need to make sure that we're in better alignment. I saw when you sat down with MHP that you said that you would not endorse a presidential candidate, that you were not going to endorse Hilary Clinton. Has that changed at all for you? No, that hasn't changed for me. I think that I'm very clear about what's at stake. I'm very clear that what's at stake is bigger than Hilary Clinton. I'm very clear that what I will be doing in this election is any and all activity that is couched in that context. I'm very clear about who I don't want to be president. Well, if you're clear about who you don't want, then isn't that an implicit endorsement of the candidate that they're running against? It's actually not. I have a lot of serious concerns and criticisms about Hilary Clinton. I know what's it's like to live under a Clinton administration. I think that it is an error to not include the active participation of Hilary Clinton when she was the First Lady in the impacts that the Clinton administration had on black communities, on poor communities, on women, including white women. For me, again, endorsing a candidate doesn't actually get us where we need to be. Again, it gets couched in personalities versus politics. That's the fundamental danger of our system. I don't think it's necessary for us to participate in that in order for us to make change and in order to participate in the process of voting. The aim here is to just make sure that these marginalized women's voices are heard and that they're participating, and who exactly they're voting for is not the focus. I think that the focus here is making sure that people are involved in a broad movement for social change. I think the focus here is that the barriers that people have to participating in the democratic system are removed, which include protecting people's right to vote, and it includes expanding people's right to vote. Lots of our folks are undocumented. Lots of our folks, because they're had contact with the criminal justice system, don't get to participate in this process. That also has to be our goal. Finally, I think that it's not just about elevating people's voices, but it's very much about transitioning that voice into some type of action that makes an impact. You can make an impact by voting in a large block, or you can also make an impact organizing in your community. You can also make an impact by holding decision makers and policy makers accountable. There's lots of different ways for people to participate, even if they choose not to vote or endorse a candidate. I saw recently the movement for Black Lives released a platform. What's the motivation for releasing a platform at this point? What I know is that there has been more than 60 organizations that have been working really hard together over almost the last two years, to really clarify what is our vision and to clarify what policies we want to see, that can help us advance that vision. The timing is actually strategic. I think what we've seen over the last year of the campaigning around who wants to be president is that there's been mostly lip service that's been offered to the concerns of black folks. We have, in particular, done a lot to try and state that in a way where the needs of our communities are being heard. Now this is another opportunity to shape the way in which our cities, our communities, are being heard. Having the platform I think unites us in a common fight, to make sure that the way that our country is being transformed doesn't continue to leave us out, and it doesn't continue to replay more issues in a way that neutralizes the power dynamics that are actually happening, that are having severe and dangerous impacts on people's lives. What is really important for me, what I really took away from the platform, was a broadened view of what exactly we're fighting against. So often when we talk about Black Lives Matter, it's very singularly focused on the idea of police violence, and I really appreciated that this platform was about so much more than that. How do we move to a place where people are thinking about state violence broadly? I think this is a push that we have been making since the emergence of many of these organizations and since the emergence of Black Lives Matter. We've always been pretty clear that state-sanctioned violence takes many forms, one of which at the hands of the police and law enforcement, but some of which is actually at the hands of other policies and practices of the state, that literally take our lives. What we can do together, moving forward, is to continue to educate ourselves about those multiple ways in which state-sanctioned violence impacts our lives, and we can continue to mobilize, advocate, and organize for policies that eliminate the ability of the state to so severely impact the lives not just of black people, but all people. The last thing I'll say on this piece is that I think one of the helpful things about this policy platform, is that it also clarifies a lot of the root causes for the problems that we face. I think what people will find is that when you take some time and really read though the platform, that it starts to become clear that institutional racism, that white supremacy, that patriarchy, and the exclusion of women and women identified bodies, and that the targeted violence against those bodies is really moving our society backwards. Those of us who really care about moving forward will be well served to join the movement, to make sure that this happens. It seems that in mainstream media, anybody who protests, anybody who shows up in front of a camera is associated with Black Lives Matter. They're seen as a "Black Lives Matter leader" or a "Black Lives Matter" protester. Is that a concern for you? I think it's a concern for all of us, for a number of reasons. One, I think it's a concern because it erased the work that so many important, innovative, and bold organizations are doing. We're really clear about the differences between us, and it's not a competitive thing. It's mostly to understand how our efforts combined actually make the impact we want. When we just talk about what's happening in the streets as Black Lives Matter it really flattens the really impressive infrastructure that grown over the last couple of years. The other impact, I think, is even more dangerous, which is that it is really grounded in aims that, I think, are meant to cause harm. When you are able to associate violence with a movement that is grounded in love and the principles of justice, the attempt there is to discredit and the attempt is also to disunify and to make sure that people don't support the movement that is calling for fundamental, transformational change. I think that the messiness there is often intentional. It's often meant to help elevate some of the longstanding narratives that we have seen come from the people who don't want to see change is this country, who believe that it's perfectly fine, that many of our neighborhoods are essentially resegregated, who believe that it's perfectly fine that the majority of people who come into contact with law enforcement in an unwanted way are people of color broadly, and specifically, Black people. It also aims to distort the fact that the majority of people who are incarcerated right now now are people of color, and in particular, are Black people. I think we do have to be very careful, one, about associating violence with a movement that has been really, really clear that the violence in this country that we need to address is violence at the hands of the state, and in particular, violence at the hands of the police. I also think that we have to be really diligent in making sure that we don't accept the narrative that by highlighting where violence is happening in disproportionate ways in our communities that we are then somehow a part of the problem. I think most people know that we are absolutely part of the solution. I wanted to talk to you about the latest uprising and activism that has happened around the police deaths of Philando Castile and Alton Sterling. We are two years out from Ferguson. Trayvon Martin was killed in 2012. I don't know if when Black Lives Matter was popularized, when it became a name, that people would've expected the activism that has sprung from it to last this long. What are your thoughts on the current activism that's taken place and how can we sustain the movement? Wow! Big question. Give me a second, I'm going to see if I can answer it simply. I agree, I don't think that people ... One, I don't think any of us expected that, not just Black Lives Matter, but the larger movement would have taken the shape or form that it has taken. I think as challenging as these times are and as challenging as this work is, I'm so grateful and so amazed and humbled and inspired and moved by all of the really powerful work that is happening all over the country. Again, as we were just talking about, everything related to protest gets named Black Lives Matter, it's so important to highlight all of the groups and all of the courage that even makes Black Lives Matter a household name. We could start with the founding of the Black Youth Project 100 or the thirty-one day takeover that the Dream Defenders and Power U in Miami, Florida did at the state capitol in Florida immediately after Trayvon's killer was acquitted. We would, of course, we have to highlight all of the important, courageous rebellion in Ferguson after Mike Brown was killed that continues today. We have to honor the groups that emerged from that like Hands Up United, which is doing breakfast programs all over the country in response to wanting to make sure that people in their community are taken care of and have the tools that they need to keep fighting. We'd be remiss if we didn't talk about the incredible work that Black Lives Matter chapters are doing. Whether it's in Los Angeles where, I think, folks are on day twenty-three of an occupation of City Hall. After yet another officer was not held accountable in the murder of a black person. BLM Chicago, which has been courageously demanding accountability for police murder. To the courage of Black Lives Matter Minneapolis who led a month-long occupation of a police precinct after the murder of Jamar Clark and they themselves actually were completely traumatized by having five people shot by law enforcement, excuse me, by white supremacists during that occupation. That's something that doesn't get talked about a lot but it should because that's where this country is heading. We're allowing vigilantism to be the rule of the day. We'd be remiss if we didn't talk about the powerful work of Black Lives Matter D.C. that's making important reforms there in their state. We'd be remiss if we weren't talking about what's happening her in New York City where, as I understand it, an elected official stepped down today and a lot of that has to do with pressure that groups have using there. It's their work around safety beyond policing is absolutely incredible and it's something that should be replicated across the country. There's dozens more chapters that are sacrificing every single day with little resources, with little recognition, that are really building and creating this movement. Every time I think about that, I'm not only moved, but I'm confident that if we continue to support that type of work and lift those folks up, that we will be successful. Then, in terms of the second question that you asked, in terms of what do we think it's going to take to sustain the movement? I think it's a couple of things. One major piece that it will take is the support of people who also have a stake in making sure that ... I'm sorry, yes, it was Bill Bratton that resigned. I've been on so many conference calls today, I couldn't get my Bills or, my Bs correct. Bill Bratton stepping down is important. I think what it takes to sustain this movement is a couple things. One, more people need to join it. I think there have been lots of people who have been standing on the sidelines, somewhat wondering if we were going to be around and if they should invest in what folks are doing. I think it's 100% clear that the answer is yes you should invest, don't stand on the sidelines talking about what you think should be done. Join the movement and do it. The second piece of what I think needs to be done to sustain the movement is I just have to say it and be really honest. I think that we need more attention being paid to what work people are doing in their local communities. We often get accused of not having solutions or not having vision and that couldn't be farther from the truth. The policy platform that was released yesterday on Monday. The policy platform that was released on Monday is really a consolidation of the incredible work that people are already doing in their local communities. I think that deserves to be lifted up and, from the beginning, we have talked a lot about how one of the major problems of the civil rights movement was that the work that everyday people were doing was subsumed while there was so much attention being paid to key figures. The reality is, yes Martin Luther King and all the people whose names we know were incredible people, but so were the people whose names we didn't know. I think we can do more, as a society, as a country, as journalists, as media, to really lift those folks up and really get into why are they doing the work that they're doing? What are the conditions happening in their community? What's at stake if they win and what's at stake if they lose? I think that will help to grow and sustain this movement. When people see, when they read about what's happening in the movement, they're actually reading about what's happening in their communities as opposed to what certain "leaders" think about what's happening. We're included in that. The other thing it's going to take to sustain this movement is a real commitment from everybody in this movement that we're going to lead by love and not by ego. That, in and of itself, is transformative and it's so desperately needed in this country. I believe with all my heart that we have the capacity to do it. When you mentioned that more people should join the movement, does that look like organizing? Does it look like protesting? What does that look like? I love this question because I think that maybe some people are sitting on the sidelines because they feel like I'm not a protester. That's okay. Protest is important but it's not the only way to participate. Having conversations with your family members and your loved ones about why you support this movement is a way to be a part of the movement. Contributing your expertise or skills to organizations or groups, even if they're not organizations, that are moving work locally to change conditions is a way to be a part of this movement. I think, in particular, if there are white folks that are out there that are wondering, Can I be a part of this movement for Black Lives? Yes, you absolutely can by making sure that you make the commitment and that you work to make other white folks make the commitment to stop colluding with systemic racism. The last thing that I know that people can do to be a part of the movement is to do the work of being more connected in your community. I was talking to somebody last night about the gentrification that's happening in the community where I live, in Oakland. Areas where we have vibrant black churches, newcomers to the neighborhood are calling the police on those churches because the noise is too loud. One way to join the movement is to work to build you community. In particular, not to transform it so a small group of people like it, but to make sure that all people in your community are valued. To make sure that all people in your community have access to making decisions about what happens in your community. And, by doing the internal work of breaking down some of the ways in which we keep each other separate. Whether that be our assumptions about people. Whether that be our stereotypes about people. I can't emphasize enough far that goes when we know our neighbors, when we support our neighbors, when we try to get to know about what peoples' histories are and what their dreams are. That's very much a part of building a new society, which is exactly what this movement is about. There's many ways to be a part of that. People use Black Lives Matter in a couple of ways. One of them is to refer to the organization that you've built, the really robust organization that has chapters across the country and maybe across the world. But they also use it as a rallying cry. Do you believe there will be an end to a need to say "Black lives matter" in your lifetime? It's my hope that we do have an end to having to say it in my lifetime. I wouldn't be working so hard if I didn't believe it was possible in my lifetime. I don't think that any of us would be working so hard if we didn't believe it was possible in our lifetimes. What that means is that we have to be courageous enough to accelerate change. There's quite a few barriers to that but we're still not at the place where folks don't say All Lives Matter in response to that. Even when faced with the contradiction that all lives don't matter in this country. If you were like me and were watching the Republican National Convention, there were legions of mostly older, white men who were chanting "All Lives Matter." That is not just symbolism. That has real implications for how we understand what the vision is of some of those folks of the world that we live in. It's not that all lives don't matter, it's that there would be a willful ignorance of the ways in which the lives of black people and other oppressed people are intentionally and systematically disenfranchised or marginalized or killed. That's the thing that we work so hard to change. I hope that in my lifetime that we don't have a need to say that anymore. It will require us to be much, much bigger and to keep pushing as hard as we can, strategically, so that we can change the conditions that we're living in.